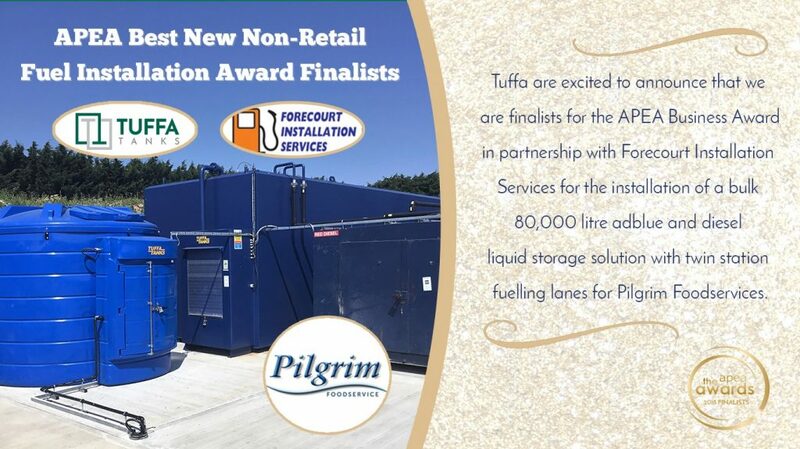 Tuffa UK is part of a joint entry that has been shortlisted for a prestigious fuel industry award. 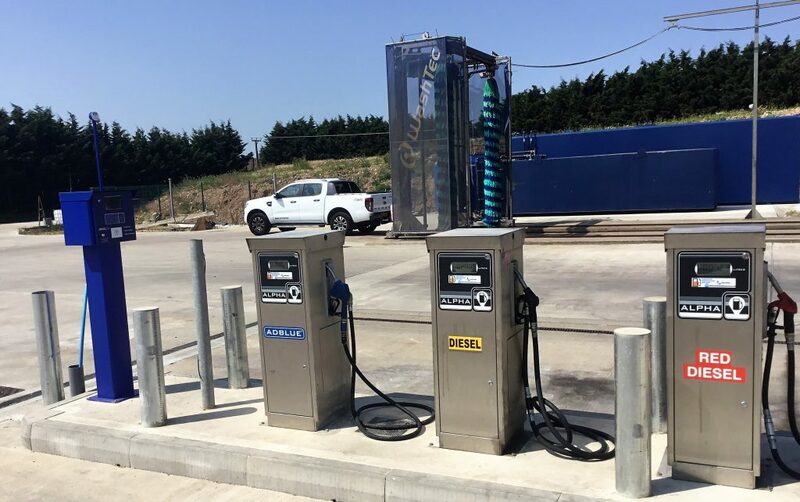 Together with our project partner, Forecourt Installation Services, we are finalists in The Association of Petroleum & Explosives Association (APEA) Awards “Best New Non-Retail Fuel Installation” category. The shortlisted project was for the manufacture and installation of two fuel tanks for Lincolnshire based Pilgrim Foodservices. The APEA was founded in 1958 and is a UK based organisation with members from the petroleum industry, including Regulators from National and Local Government Authorities, oil companies, equipment manufacturers together with suppliers, service and installation companies. The APEA brings the industry together and works for a safer environment. Our Award application featured a project we carried out for the food wholesaler, Pilgrim Foodservices, who required an 80,000 litre bespoke steel diesel storage tank and a 10,000 litre plastic AdBlue tank to cover the daily fuelling requirements of their fleet of 60 delivery vehicles. Tuffa designed and manufactured the tanks which were delivered to site in Lincolnshire. Our project partner, Andrew West at Forecourt Installation Services then completed the installation to the twin fuelling lanes required by the Transport team at Pilgrim Foodservices. You can read the full story of the project here. Tuffa UK at APEA Live! APEA Live is the industry’s biggest three part event. It takes place on November 22nd at Stadium MK, home of the MK Dons Football Club. During the day, a conference and exhibition takes place, before the same venue hosts the spectacular APEA Awards ceremony on the same evening. In addition to being finalists for an award, Tuffa UK will also be exhibiting our new range of Petrol Tanks at APEA Live. The Petrol Tanks are manufactured from high quality mild steel and finished in a new silver grey colour. Tuffa’s unique patented Fire-Protection material is factory-fitted on the primary tank. There is a minimum 110% capacity integral steel bund around the tank to comply with Secondary Containment Regulations. The tanks have a newly designed optional cabinet with a secure lockable access hatch and hydraulic lid. They also have a 4″ BSP fill connection with cap and chain, a 2″ 4.5m vent stack and comes with a choice of pump options and easy fuel metering. They are fully weather-proof, providing safe, secure and compliant petrol storage and dispensing for up to 30 years. You can discover the new range of Tuffa Petrol tanks by visiting us on Stand B24 at APEA Live, Stadium MK in Milton Keynes on November 22nd. Tuffa UK General Manager, James Shenton is looking forward to the event. “APEA Live is an important fuel industry exhibition and the idea platform to showcase our new Petrol Tanks. To be shortlisted for this top award with all the key players in the industry is a fantastic achievement for Tuffa – if we are winners again at the APEA Awards Dinner, it will be the icing on the cake,” he added. 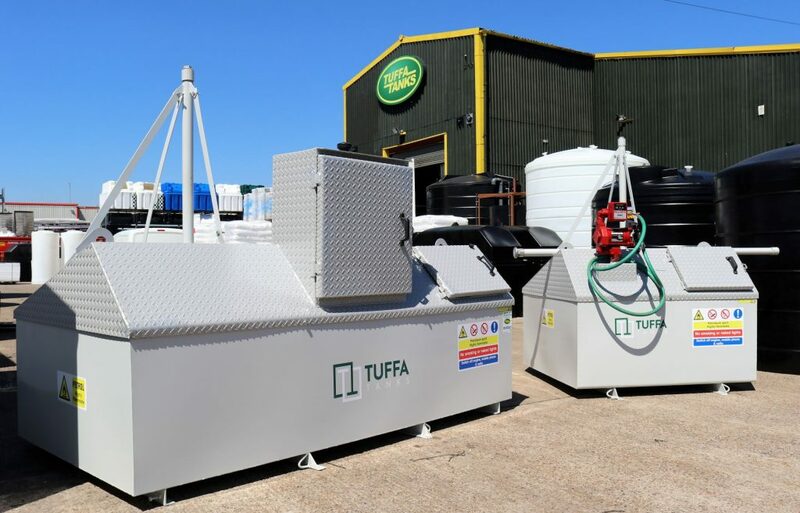 Find out more about Tuffa’s new Petrol Tanks here or call Dee, Amy or Mike in our sales team on 01889 567700 for all price and technical enquiries.